Leading Rural Agency YoungsRPS signs deal with Hexham & Northern Marts to Share Premises and Business Opportunities. Chartered Surveyors, Land Agents and Property Consultants, YoungsRPS, have announced it is to open offices within Hexham Mart in Northumberland. This is an exciting partnership, intended to benefit the farmers and rural businesses who regularly attend the mart. 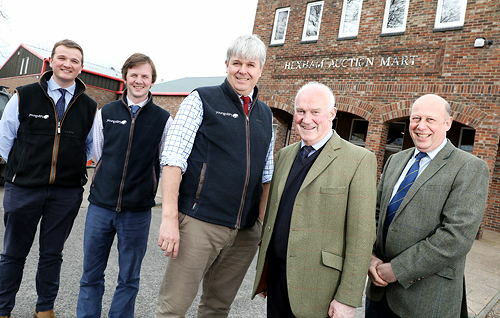 L-R; Matthew Wallace, Rural Chartered Surveyor at YoungsRPS; Harry Morshead, Rural Chartered Surveyor at YoungsRPS; Charles Raine, Director at YoungsRPS; Jimmy Walton, Chairman of Hexham and Northern Marts; and Rob Addison, Managing Director of Hexham Mart. Both YoungsRPS and Hexham and Northern Marts have a long and established heritage within the areas of business in which they operate. This agreement is seen as a good fit for both, and an effective way to offer an improved, close-at-hand service to farmers, by people who have a deep-rooted understanding of agriculture and farm business issues. Hexham Mart is Northumberland’s leading livestock market and YoungsRPS is a highly respected rural business operating across Northern England and Scotland. This joint venture provides a platform to support farmers in an active mart environment, effectively bringing the professional services of a land agency closer to the farmers they serve. “We have been in discussions with Hexham Mart for some considerable time and are delighted that they have concluded that we are the best partner for them to offer a full professional service to their customers. We, for our part, are of course keen to tap into the passing trade in the mart. “In recent years, our two companies have worked together jointly in terms of live and deadstock sales. The mart’s team of auctioneers are out on-farm and can identify their client’s need for advisory services, and we have the full range of experts willing to help. Open Monday to Friday, the Hexham Mart office will be staffed full time by Charles Raine, Director of YoungsRPS, and Harry Morshead, Chartered Surveyor. They will be supported, by Chartered Surveyor, Matthew Wallace. The main Hexham office will continue to offer an extensive range of advice, including property sales and lettings, valuations, landlord and tenant issues, legal assistance, property and farming projects, planning and development and estate management guidance. “As a company, YoungsRPS are deep rooted in agriculture, and have a tremendous reputation with farmers in this area, so we are delighted to welcome them to the mart. Our two companies work together well and have established a natural synergy, so this collaboration gives our customers instant access to professionals. Hexham & Northern Marts has been servicing Northumberland and Tyne Valley Farmers for over 100 years. At Hexham, it sells livestock weekly on Tuesdays and Fridays, and conducts specialist evening sales. It also owns and runs Rothbury and Scots Gap Marts. In addition to livestock and agricultural equipment auctions, the company has quarterly sales of antiques and furniture. YoungsRPS traces its origins back 140 years to James Turnbull & Son, founded in 1879 in Chester-Le-Street, Co Durham. The present group was created through mergers of Youngs Chartered Surveyors with Rural Property Services and Stanton Mortimer. YoungsRPS specialises in residential, commercial and farm agency sales, all aspects of farming and land management, and planning and development. It has offices in Sedgefield, Alnwick, Newcastle, Northallerton and Dumfries.